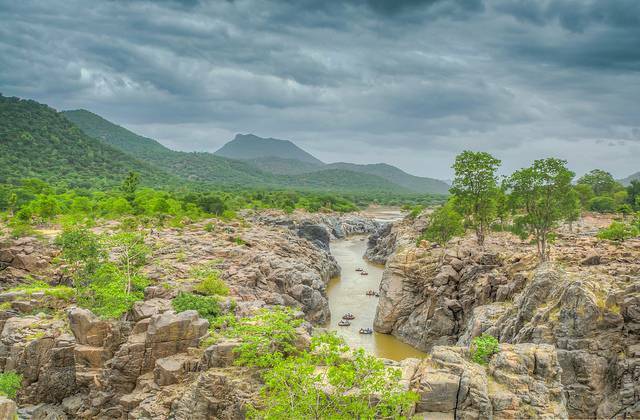 Hogenakkal Falls or Hogenakal Falls is located on the river Cauvery and creates a mesmerizing view of the water falling from a height amidst purity and serenity. Sometimes referred to as the "Niagara of India" it is also famous for its local coracle (boat) ride in the waters of Cauvery. Boating near waters of Hogenakkal is not allowed in rainy season and is little costly. Do indulge in trekking along the Melagiri Hills. Tourists need to be carefull on rocks here as they are quite slippery here. Hogenakkal Falls is located about 50 Kms from Dharmapuri town in Tamil Nadu and about 180 Kms from Bangalore. To reach Hogenakkal Falls from Bangalore will take about 4 hours of driving time. Apart from Shivasamudram falls, Hogenakkal falls are the other biggest waterfalls on Cauvery near Bangalore. Cab for Hogenakkal falls trip can be easily booked online including Trodly. You will find few road side stalls selling snacks and fresh fried fish. There are no decent restaurants around this place or much of the route. Trodly Recommends: Visit in a group for safety if you have female company. Do not plan to stay later than 5.30pm. Being a famous spot, its pretty crowded on weekends. Try to reach early to avoid the crowd. Also avoid staying back here after 5 in the evening. Not many options to eat available here. Bring some snacks and water along. Fresh fried fish is sold by street vendors near the falls. During heavy rains in monsoon season entry to falls might be closed! So check before leaving. In normal season coracle (boat) ride is a must try.